Just an interesting pic that made me think. "When the thousand years are over, Satan will be released from his prison and will go out to deceive the nations in the four corners of the earth—Gog and Magog—to gather them for battle. In number they are like the sand on the seashore. They marched across the breadth of the earth and surrounded the camp of God's people, the city he loves. But fire came down from heaven and devoured them. And the devil, who deceived them, was thrown into the lake of burning sulfur, where the beast and the false prophet had been thrown. They will be tormented day and night for ever and ever." The battle will not even be close! For those who don't believe: Don't be "deceived by Satan." vs. 10. Look at the end results. Research the historical facts. Christ rose again! its more like satan is an ant running around on this earth til the day when God will CRUSH him beneath His sandal and send him to hell. wooh, praise God! hahahah! 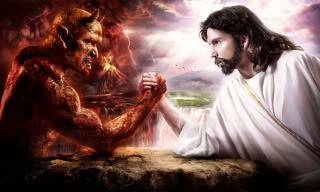 I guess you could infer that since Satan is the one with the struggling look on his face, and Jesus is just like "whatever..", He is the all powerful, and Satan is only allowed to do what God wills. Kinda like when you actually are arm wrestling, and you let the other person push your hand a bit. But in reality, you know you're gonna win! I didnt even know that was Jesus, I thought it was Dave Grohl from Foo Fighters!